I love baking. I love sharing baking. I love receiving baking. I love eating baking. Who doesn’t?! Christmas is always a time of the year that I excitedly go totally overboard in the baking department, making way too many goodies and loving every minute of it! 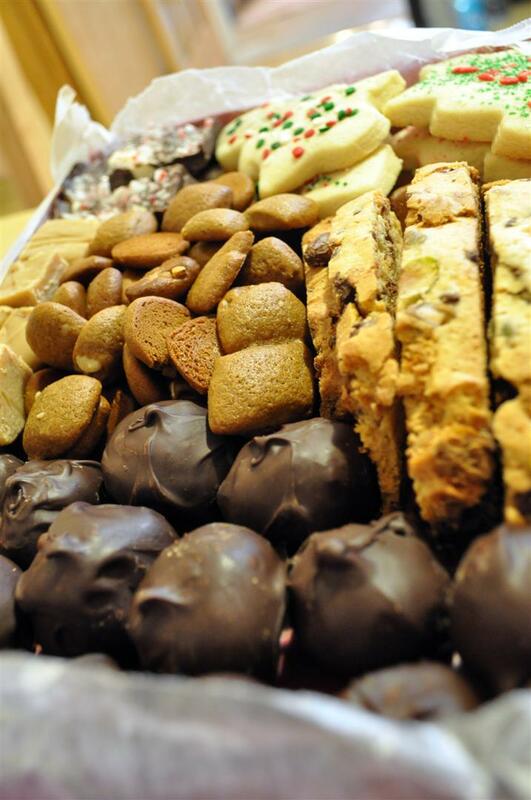 Going clockwise from the left, above: port and prune truffles, fudge, peppermint bark, sugar cookies, Christmas biscotti, and peppernuts. I know I’m always interested in some new recipes, so I thought I’d share these here with you. Roll into walnut-sized balls, and place the balls of mixture on a foil-lined tray and freeze until really solid, about 2 hours. Melt the 2 packets of chocolate melts on medium to low power, stirring often. 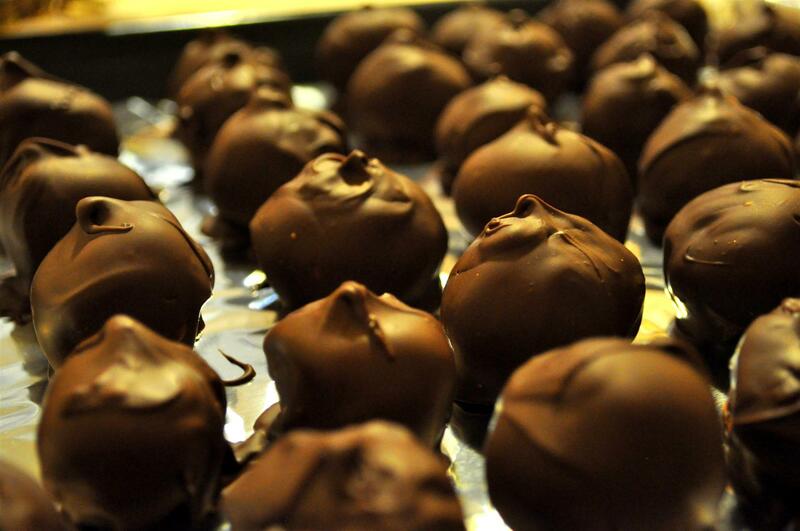 Dip the frozen truffles in the melted chocolate using a chocolate dipping form or 2 teaspoons. Drip off excess chocolate and allow to set on a tinfoil-covered tray. Store them in a cool place. If you have to put them in the fridge, make sure you line the container with paper towels and in between layers of truffles too to absorb the moisture when the truffles ‘sweat’. Melt one packet of semi-sweet or milk chocolate chips and spread it as evenly as you can over the bottom of a lined 9 x 9 (or thereabouts) dish. Then go ahead and do the same with white chocolate, this time spreading it on top of the dark/milk chocolate. (You can wait unit the bottom layer is set, or if not, it makes nice swirling patterns.) Then go whack about 3 candy canes in a bag with a rolling pin (or if you’re lazy like me chop them in the food processor) and sprinkle it over the still wet chocolate. Let it harden in the fridge, and then break or cut into manageable pieces. Mix sugar, molasses and butter in a saucepan and bring to a boil. Let cool, then add eggs well-beaten and the flour sifted with soda, spices and salt. Add flavouring. Roll dough and cover and refrigerate for about a week. When ready to bake, add nuts and additional flour if needed. Cut or roll into small balls and place on a greased baking sheet. Bake at 350°F for 8 – 10 minutes. Do not over-bake as they can get too crunchy. Take off the baking sheets as soon as they get out of the oven. These cookies can be stored indefinitely. Dump the dry mix in the wet, and mix until combined. With a wooden spoon stir in about 1/2 c. shelled pistachios, 3/4 c. chopped dried strawberries, 1/2 c. or so of white chocolate chips, and a smattering of mini chocolate chips. On a parchment lined baking sheet, pat into a long flat loaf with wet hands (about 5″ wide and 15″ long). Bake at 350 degrees for 30 minutes, or until lightly brown and not squishy to the touch. Pull out, reduce the temp in the oven to 325, and let cool on the counter for at least 20 minutes. Using a bread knife, cut into one inch slices, and line up on the same sheet with new parchment. Bake for another 20 minutes or so, or until desired state of crunchiness is achieved. These are great with tea or coffee, frozen or not. 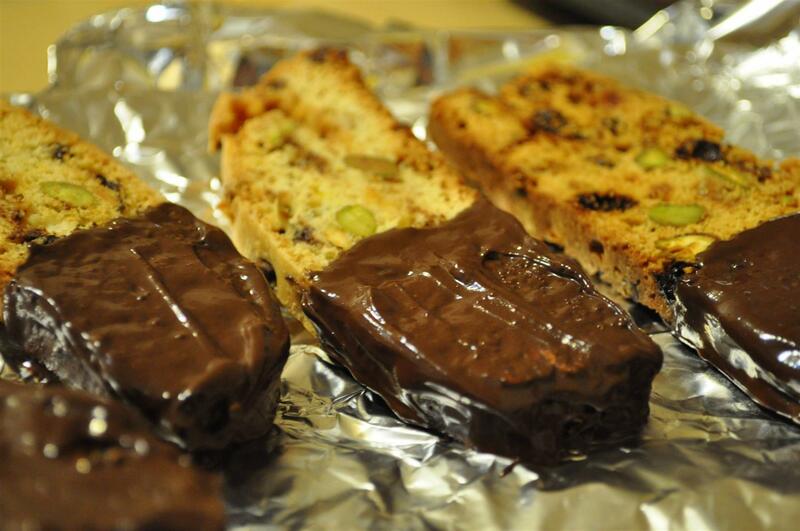 If you have left-over melted chocolate from dipping your truffles, you can always dip your biscotti! 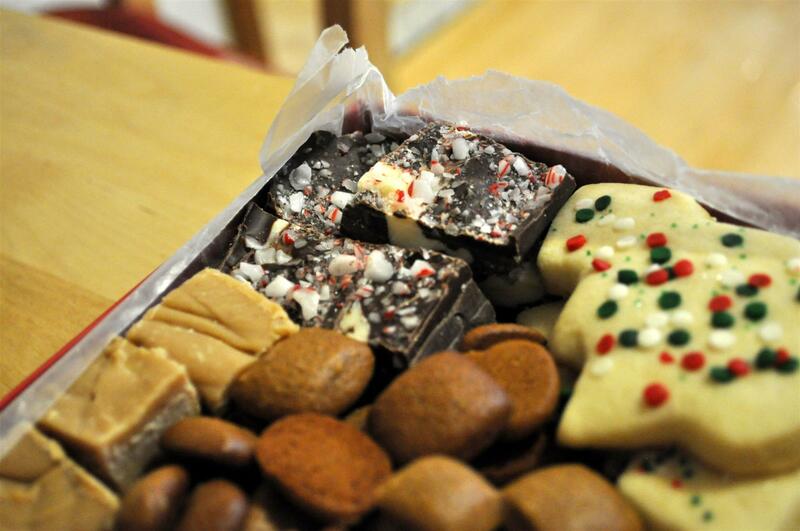 Very delicious, utterly satisfying, and the best Christmas gift that a hostess could wish for! 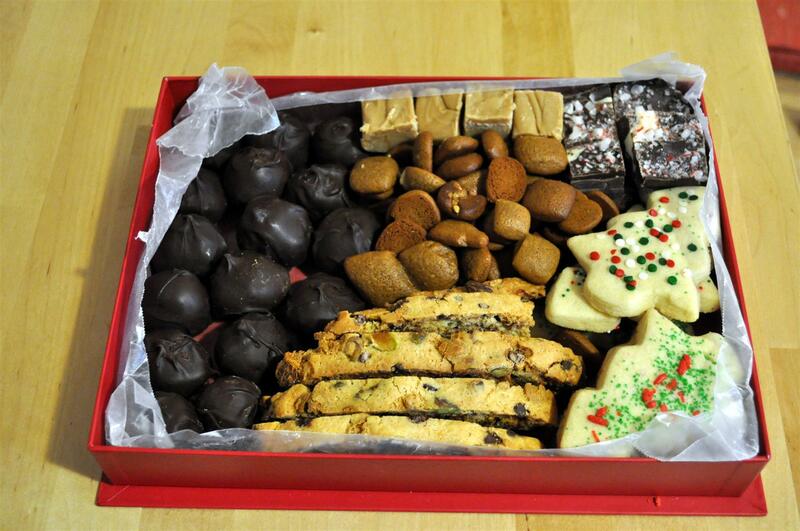 Thanks for the recipes – they will go into my permanent folder of cookie delights. Delicious pictures and descriptions. But I don’t know about that “optional” for the anise flavouring in my grandmother’s recipe :-). I was just talking today with a Dutch lady at church who commented that anise flavour is the essential ingredient of peppernuts! (I had taken some peppernuts to share around.) I now use, by the way, ground anise. Much easier than trying to smash the seeds myself. The peppernuts I took were rather soft and chewy. I manage either to overbake or underbake, and these were in the latter category, but no one seemed to mind. Peppernuts can’t be too crunchy, in my opinion. That’s what makes them unique (plus the anise, seed, I guess, which we leave whole for a bit of a punch every few bites). Great dipped in milk. Um, Yum?!! :) Looks delicious! Good job and nice pictures! Yum, I’d like to try that “bark” recipe! Yes, we made peppernuts without anise too for the first time this year – we’d run out (it’s the only recipe I use it in, once a year) and I had no time to purchase any more. They were OK, but I really do like the anise flavour.